In Japan, 28 percent of its total population 126.6 million are elderly (over 65). This includes 2 million over age 90 called the “super elderly.” The Japanese government estimates that by 2065 40 percent of the population will be elderly, with average life expectancy of women over 91 years, and of men 85 years in the country’s decreasing total population which will reach near one half of the present. The Japanese government has been offering elderly health care, two low cost universal health care insurances, one medical and one long term nursing care (LTC) together with various aides from taxes. Over the years, the government has become overburdened with financing elderly health care, which has necessitated various reforms for the universal insurance system to be sustained, and to avoid leaving debts to younger generations. In early 2017, the government decided to increase these insurance premiums and affordable elderly out-of-pockets burdens from 20 percent to 30 percent effective August 2018. 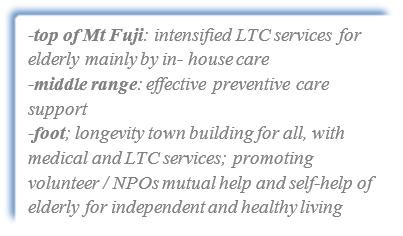 In Japan, it has been the local (both prefectural and municipal) governments which manage these medical and LTC insurances. Japan is a socialistic country in terms of universal social insurances available to all citizens, rich or poor. Since the 2016 reform, the “Act Securing Hometown Medical and Long-Term Care, etc.”, local governments have tried to promote integrated service delivery to the elderly using these two government insurance premiums plus an additional cost shared equally by national and local taxes. The integration of services out of two insurances helped local governments reduce cost, and increased the convenience for citizens — but not enough. Given freer hands, each local government, attuned with the 2017 national government reform plan, decided to review the system before organizing reform to further reduce cost and to suit own community circumstances. In Shizuoka, elderly make up about 30 percent of the total population of 715,000, with increasing “late elderly” at age 75 and over and even “super elderly.” The municipality is marked as a “super ageing society” with average life span of women at 87y ears, and men at 80 years, while the overall population is decreasing. 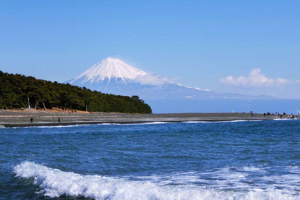 Aided by mild climate and rich food resources from sea and mountains, these years the citizen’s average healthy life span of 74 years is ranked the highest in Japan. Shizuoka is known as the retirement place of the first Shogun (General), the founder of the long-reigned Edo period (until the year 1868). For the 2017 review on nursing care and preventive support, the municipality conducted a need survey and heard the real voices of elderly people. The surveys indicated about 25 percent of the total population are elderly couples or one elderly person living alone at their own home. About 10 percent of them are receiving either nursing or preventive care. Out of all the voices, the following three points came up as their main concerns and desires, which the municipality could consider in upcoming reforms. 1. The anxiety of not knowing where to go when they cannot live alone; government encourages their lifetime living at home; LTC institutions are poor in quality and quantity. 2. The desire for free choice by the elderly of the services; need for de-regulation of service delivery as currently not allowed to take mixed services offered by two insurances. 3. Concerns on severe lack of care takers and their low wages; government, rather than increasing their wages, is contemplating short-term immigration of overseas care takers; it would be a blow both to potential immigrants who must work in low wages and would be forced to leave after a few years due to Japan’s strict immigration policy, and to Japanese elderly who do not speak foreign languages; many middle-aged Japanese housewives are motivated to work as care takers if wages were normalized from extreme low. Currently, the elderly people are pioneers of how to live long in an unprecedented super ageing society. Many of them take their own handicaps positively by using their remaining abilities to enrich their life by engaging in hobbies, volunteer work, travelling, etc. It is interesting to learn that about 90 percent of the elderly, in both US and Japan, feel generally content in their life, despite the difference in problems of living, according to an international comparison. The current reforms in Japan would bring heavy burdens to the elderly. But the elderly would accept Japan becoming less “socialistic” nation as long as the universal health care insurance system will be kept sustainable in future.